We are going to briefly take a look at the glad tidings of past scriptures and the beliefs of past nations concerning the Savior. Belief in a savior originates from the divine nature of man; it is this belief that gives hope to the hearts. However; this belief has been recorded in the ancient civilizations’ books. Furthermore, even though there have been differences in the belief in the existence of a savior, this belief has existed amongst most nations, being related to many faiths directly. Due to the divine law of Allah of sending prophets to promise the arrival of a savior, the belief in a savior has been mentioned in other holy books. Though the narrations regarding the savior in other beliefs do not all coincide exactly with the Shiite faith, they at least prove the existence of a savior. This article will be elaborating and presenting the different beliefs of previous faiths about the existence of a savior. So, in this part of the article we shall discuss the glad tidings of past scriptures and the beliefs of past nations concerning the Savior. In 35 out of the 150 parts of psalms, Coming of Savior (The Psalms of David) is mentioned. Let it be emphasized that these books, in the view of Shiite, are not holy books. In fact these are adaptations of past Scriptures and are created by the nature of pure men and these predictions should be merely of revelation sources. Dartek Dideh, Patkil and Shaboohergan. Other parts of Zoroaster’s foretellings on “Bahman Posht” are available in detail. 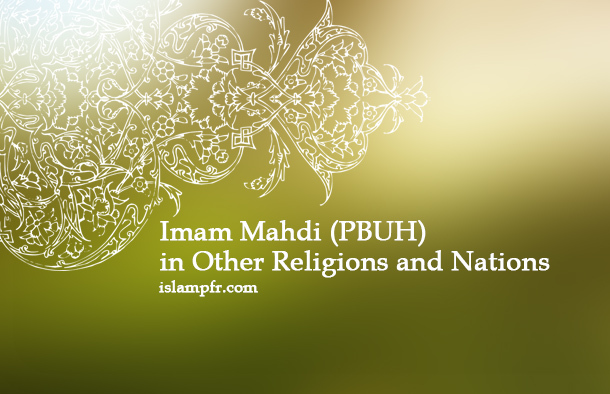 However, the Shiite believes Mahdi (PBUH) is of the descendants of Yazdgerd’s daughter. She was the wife of the third Imam of Shiites, Imam Hussein (PBUH), who is the ninth forefather of Imam Mahdi (PBUH). Ancient Iranians believed that Gorza Sepah, their historical hero is alive and hundreds of angels take care of him until the day he rises and corrects the world. Islam has believed that someone arises from the east and unifies all tribes of Islam and makes them dominant in the world. Germans believed that a victorious man arises on their behalf, making the Germans dominant in the world. Serbian people had faith in the coming of Marco Karliowich. Jews believe that the Messiah (the great savior) will come in the apocalypse and rule the world forever, but they consider him son of Isaac, while he is clearly the son of Isma’il. The Scandinavians believe that there will be difficulties for people. World wars destroy most of the communities. Then Odin, the Divine power comes and dominates the entire world. Greeks say ‘Kal’, the great savior, will come and save the world. Central American tribes have believed that “Cotzlecomel”, the savior of the world, will be victorious after some major events happen in the world. Chinese people have faith in someone called ‘Krishna’ as savior of the world. من دانشجوی رشته مترجمی زبان انگلیسی هستم مطالبتون رو خوندم سایت بسیار قوی و تاثیرگذاری هست ولی باید رنکینگش داخل گوگل بره بالا. عالی هستش،من دنبال اطلاعات میگشتم ک به زبان انگلیسی باشه تا بتونم به اشتراک بزارم. مشکلم با سایت خوبتون حل شد.انشالله به امید موفقیت های بیشترتان . I am studying Catholic Bible in English and I have found some interesting facts. Can I send you some English material and if the answer is yes email me and let me know the best way to do this.